American Express and Zynga are teaming up to make it easier than ever to turn your money into virtual cows, tractors, and whatever else the folks at the multibillion dollar social gaming company can cook up. And this time, it doesn’t involve actually forking over cash — at least, not directly. Some of the rewards come fairly easy, with prices beginning at 200 points; others run into the thousands. To help make these rewards more appealing, Zynga is offering exclusive virtual items like a Purple Cow in FarmVille (540 AmEx member reward points), a Café World Amex Lightning Stove (1945 points), and other goods that can’t be acquired any other way in the games. More items will be coming on December 6, with support for more games, including FarmVille. In addition to these virtual goods, users can buy game cards, with denominations starting at $2 for 200 points and running up to $50 for 5000 points (you can get both physical and virtual game cards). Do the math and you’ll notice that this is 100 points for every $1 of in-game credit. This works out to 1% of your spendings, which is a pretty standard ‘cash back’ amount seen in credit card rewards programs (some programs will do better than 1% for certain items, like hotels). Obviously none of this is actually free — you’ll be giving up cash, discounted hotel rooms, or whatever other reward program you might have chosen instead of Zynga’s. But you can bet that plenty of people will make the switch regardless, if only because they want access to the exclusive items that Zynga is offering through the program. And the relatively small number of points needed to ‘purchase’ a new virtual good will mean that users can reward themselves more often, which they always like. 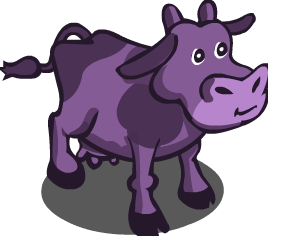 After all, who doesn’t want an elusive purple cow wandering around their farm?